After radios, the most important thing to operate are antennas. W4AQL has a few towers on top of the EE building. One is at 90 feet, containing our VHF and UHF antennas. At 20 feet we have a 20-Meter 4-element beam and at 50 feet we have a TH7 and a 2-element 40-Meter yagi. Additionally, on a tripod mount, we have an az-el rotator containing our satellite antennas (2M and 70cm). Along with all this heavy iron (er, aluminium), we have dipoles for our low bands, 160-, 80-, and 40-Meters. In the works are plans to possibly load our 90 foot tower into a vertical on 160-Meters. Living in the middle of downtown Atlanta can create challanges on the lower bands (to say nothing of intermod on VHF!). This means that any low band antenna we put up will be susceptable to city noise, but it's something we've come to accept. We are making small inroads, though, and have a low-pass filter installed that does do some damage to the city noise, but it's not as good as being in the middle of nowhere. 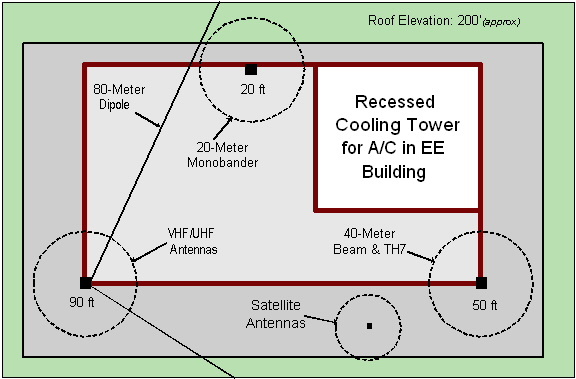 Below is a picture of the roof of the EE building where are antennas spend their time. Clicking on the various towers will take you to a pictoral depiction of their eleveation as well as some measurements we made of them with a wonderful network analyzer that we borrowed from the EE department.